Proper nutrition is important for anyone’s health, but it is especially crucial when bringing new life into the world. We recommend any mom hoping to conceive start taking a high quality prenatal supplement at least 6 months in advance. Some of the most important steps in a newborn’s development happen in the first 6 weeks of pregnancy, when mom sometimes doesn’t even know she is expecting yet. Rather than wait for the positive test, be proactive and make sure your body is prepared for a healthy baby and pregnancy! 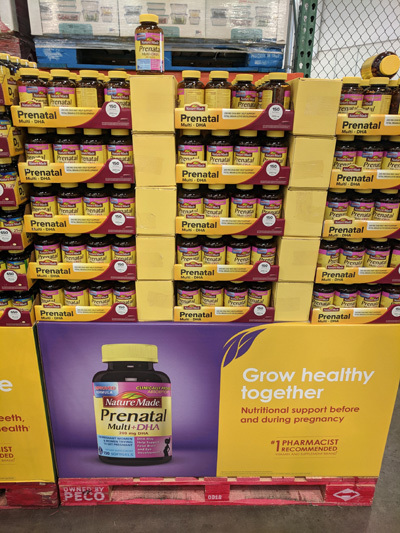 I walked into Costco recently and saw this large display of prenatal vitamins. While I love that it is prominently displayed and moms are being reminded to make sure they are taking steps to care for their growing child, it is important to remember that quality and source is of extreme importance! If a supplement does not contain the vitamins in the proper forms and contains toxic add-ins, it could be doing more harm than good. After a quick glance I found that this particular prenatal fell short on multiple accounts. Unfortunately, that is the case with most of the brands that we find in stores. Thankfully, there are companies who are committed to providing the highest quality of supplements at an economical cost. Whether you’re currently taking a prenatal or other multivitamin (these rules apply for both! ), check the labels and let us know if you have any questions. If yours doesn’t pass the test, let us know next time you’re in the office and we’ll get you set up with a good one! Don’t take any supplements? Check out our Core Four article to see why it’s something you should consider starting!